We searched out one of the designers of this game you have made to mirror our world and plucked these thoughts from his dreams. We hope you find them enlightening. Hi. My name is Chad Brown, and I’m the lead developer at Lone Shark. I want to talk with you all a little about what makes Thornwatch cool. There are many great things about this game, but for me, what really hits home is how the rules and the art come together to help create and reinforce the aesthetic of the Eyrewood – a fantasy world that’s filled with whimsy and wonder, but one that remains serious, sometimes deadly serious. Imagine playing a game of Hot Lava with a half-dozen seven-year-olds. Everything is going great, until your intrepid band comes to a large gap. Eyeing the gulf between ottoman and loveseat, one of the kids looks up at you and says, “You all can make it out, if you leave me behind.” To me, that is the feel of the Eyrewood. Although graphic design is not my field, I do want to take a moment to talk about the stellar work of the artists and designers who put these storyboard together. All of the major elements contribute to the idea of a “graphic novel adventure” — playing a comic book. It starts with the art pieces and the story text, of course. The unnamed villager, both frightened and protecting. The monster (imagine a cross between a flying squirrel and a hyena, larger than both and corrupted by some malignant force) menacingly advancing on one the outmatched villagers. Finally, a part of the village, obviously in trouble. It uses panels laid out like a comic book, with short captions in hand-lettered fonts. Each panel’s art and words convey the necessary bones of the story, while also relaying how knowledge is passed in this world: poems and rhymes, learned as children, but deadly serious. The specific rules for each story sit in their own caption-box to the side, as if a scrap of parchment or a worn wooden sign were laid over part of the page. Next to this, we’ll build a map, where the action happens. Different arrangements of tiles portray varied landscapes inside solid borders, again reminiscent of comic book panels. Onto those map tiles we place character and monster pawns. These lie flat, sitting in the plane with the scenery, with just a little depth, so they can be arranged like characters sitting in front of a background. When we want to add effects to the map, we do so by adding small terrain cards to the map — these captions create mechanical effects on their comic-like panel. Speaking of mechanics, that’s where I get to pitch in. One of my favorites is momentum. Laid out near the judge is a row of momentum cards, art pieces representing each actor in the scene, between a starting “Root” and an ending “Edge” card. As heroes, denizens, and monsters take their turns, their momentum card is turned to indicate their status. 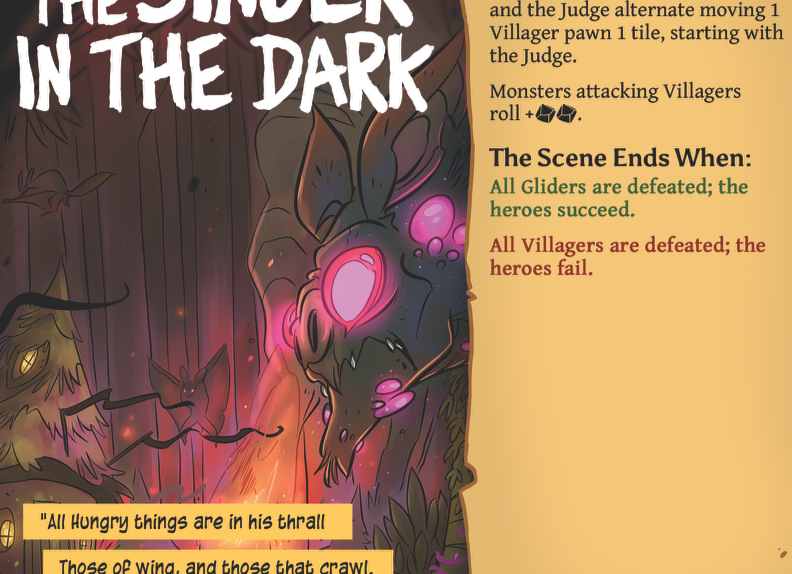 When conflict happens, monsters and denizens (but not the Thornwatch!) that get hurt are pushed down in momentum, shifting ever closer to the edge – and if they get knocked off the edge, they are defeated. Mechanically speaking, momentum is probably my favorite part of Thornwatch. It serves as a combination initiative tracker for the scene and health indicator for the monsters and denizens. Because momentum cards are simple art cards, they reinforce the graphic-novel representation. It’s clearly visible to everyone all the time, which helps to keep attention focused on the action rather than on note-keeping. Because it’s laid out randomly each round, the momentum track creates an ebb and flow to tactical decisions, and it encourages teamwork. It also created a bunch of design space for us. Right from the start, the way that Thornwatch are hurt (wound cards added to their decks) is different from the way monsters and denizens are hurt (shifting in momentum towards and of the edge). The Thornwatch are supernatural spirits summoned out of the Eyrewood in response to unnatural dangers; this mechanical difference reinforces the narrative divide. Beyond that, it helped us create Pack monsters – groups of monsters that act in concert, using many pawns but only one momentum card. After that, we built special monsters – guardian creatures that stop their fellows from being pushed past them in momentum, multi-headed monsters that have multiple momentum cards, and special effects that don’t have pawns on the map at all, but do happen in the same sort of timing scheme as heroes and monsters. All of this came out of our core design goal from the earliest versions of the game: find parts of the game that felt like overhead, bookkeeping, or that focused attention away from the map and the players, and reduce or remove those parts. While it’s certainly not the only nifty thing about Thornwatch, in my opinion, it’s definitely one of the coolest.